1958: born in Budapest, Hungary, in army officer’s family. Half a year later we returned to Moscow, Russia (than Soviet Union). 1978: entered preparative course at Pedagogical University to study drawing, painting and composition. 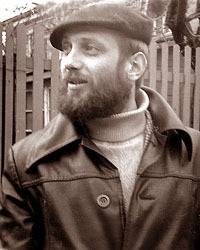 1984: graduated from Moscow Pedagogical University, Fine & Graphic Art Department. My Thesis was Human Head Drawing Methodology. Right after graduation I started to teach drawing & painting. Architecture Department, and later at Moscow Pedagogical Institute, Fine & Graphic Art Department. 1985: started to participate in art exhibitions. 1985: got а job at the Drivers Cultural Center as Head of Drawing Department. I was supposed to cultivate love for art in the hearts of Road Technical School students. However, they proved to be immune to it, and in 1986 I found a child’s club in Baumanskiy district where a drawing teacher was required and where I still teach kids & grown-ups drawing and painting. 1986: found a child’s club in Baumanskiy district where a drawing teacher was required. That’s how the story of what now is known as Baumanskaya School of Painting began. It now includes painters Sergei Dorodny, Nadezhda Kalyagin, Boris Norshtein, Sergei Ovsyannikov, Konstantin Sutyagin, Svetlana Sutyagin and Alexander Shevchenko. 1988: that’s the year of my creative birth. What I call ‘my’ painting style now, first appeared on April, 30. 1989 – 1990: worked as a teacher of clastic anatomy at School-Studio of Moscow Art Theatre, Stage Costume Department. 1991: became member of the International Association of Artists and Critics. 1994: got an award of the All-Russia Exhibition Center for teaching children (Golden Medal). 1998: became member of the International Art Foundation. 2006: my biography was published in the encyclopedia ‘Who is Who in Russia’. 2013 – 2014: worked as a drawing teacher at British Higher School of Art and Design (Moscow). 2015: moved to Barcelona, Spain.